By the time we reach the put in the rain has already begun. It isn’t really all the way rain, but more of a heavy drizzle if such a thing exists. 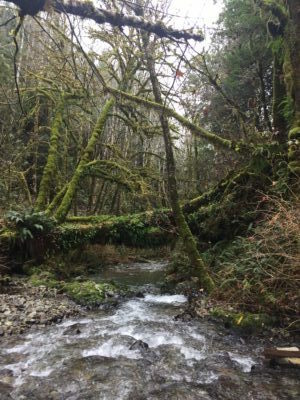 Using the open back hatch of the Jeep as an umbrella I change into my waders, lace up my wading boots, slap on a raincoat and get ready for another beautiful day spent knee deep in a creek, getting rained on while chasing after salmon. Today we’re in the West Branch of Mill Creek, in second growth redwoods just upstream from the skyscraper sized behemoths of Jed Smith State Park. The chinook are in. In fact this survey may mark the end of the peak of chinook spawning. Last time we surveyed this reach there were 36 new redds. Up until last time maybe only a dozen or so had been found in total. So we’ll see what we find today. People seem to get really confused when I tell them that I count fish for work. But that is basically what I do. Coho salmon are listed as threatened under the endangered species act in California and that means that serious action is needed to keep them from vanishing from our rivers entirely. As much as it may seem like a simple question, it is actually pretty difficult to get a decent, meaningful estimate of population size and viability. To try to answer that question we split all of the potential coho habitat in the watershed into 2ish kilometer reaches, then survey them in various ways. In the fall and winter we count the nests that salmon dig in the gravel called redds by walking each reach repeatedly about every two weeks. Each redd represents the final successful reproduction of an individual female, which can be more informative than a raw population count. Meanwhile our various juvenile surveys in the spring, summer and fall help us determine habitat use, distribution and movement across the watershed and overwinter survival. Hopefully, monitoring on all of these levels will help us know not just if the population is rising or falling, but also at what stage and why. In years past there has even been a DIDSON sonar device near the mouth of the Smith operated by another organization. This device may provide the best raw count of adult salmonids returning to the river to spawn (though it cannot differentiate well between species), but unfortunately that project has not been funded for several years. In fact, our project did not receive its normal funding this season either so we are operating as a true skeleton crew. 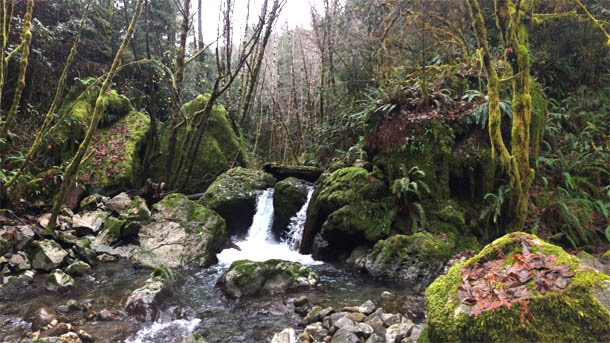 In previous years we have been a crew of eight, and in addition to surveying the coho stronghold of Mill Creek, we also surveyed a good portion of potential habitat throughout the rest of the watershed. This year the crew is down to just two old veteran fish freaks, myself and my coworker Jesse, along with a rotating cast of three different wildlife techs on loan from the parks. It’s actually been really neat working with the parks guys since they also have a pretty deep knowledge of the Mill Creek area, but from the perspective of a host of other types of critters ranging from carnivores to birds to amphibians. The other day on our walk back to the rig after finishing a survey Tony stopped off at a small feeder creek and showed me some torrent salamanders. Sweet! I also enjoy pointing at random small birds and asking “what’s that?” And getting a full rundown of species, habits, seasonality, etc. The downside of the small crew is that our survey frame is now reduced to just Mill Creek above the forks. With the exception of Baldface Creek on the North Fork Smith, which is not practical to access in winter, the vast majority of coho in the Smith spawn in the East Fork or West Branch of Mill Creek, and yes, the naming convention is strangely inconsistent here, but just go with it. 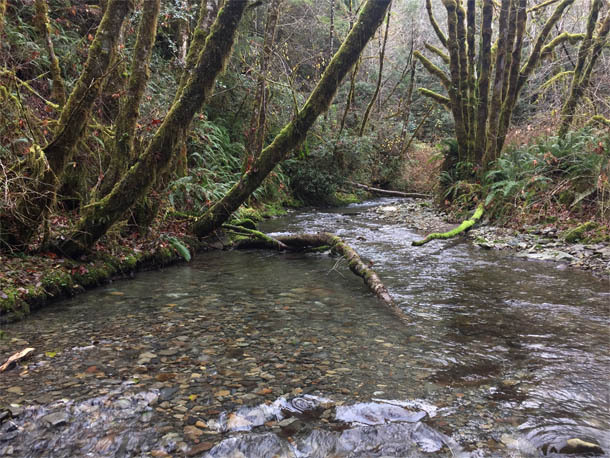 But these fish do utilize different parts of the river depending on water levels and other conditions, and by focusing only on the Mill Creek forks we run a huge risk of missing important happenings in other parts of the river. This has been an odd water year with lots of rain coming very early, then sustained rain but no other real high flows. All of this is causing the little bit of the chinook run we are seeing to behave very differently than we are used to seeing. Usually the chinook trickle in with the first rains as the rising water allows them to access the creeks. Chinook would start building a few redds by early/mid November, then peak around the end of November after which they would slowly peter out, with only a few haggard old zombie fish hanging on into mid/late December. As it is this year we have seen very little chinook spawning in November despite moderate flows and a good year for sport fishermen early in October. In November the sport fishermen’s luck ran out, but then it wasn’t until December first that we saw some spawning, then we had lots of spawning. But mostly in the West Branch. Today we pick up a few new redds, and lots of carcasses. Salmon die after they spawn, then we swoop in and take genetic samples. We take lots of genetic samples today. When we meet up with the other crew the story is the same: a couple of new redds and lots of carcasses. So what does it all mean: are we looking at a really bad year for chinook? Did they all just spawn somewhere else? Is there more to come? These are all questions we ask ourselves to some extent every year, but this year with the tiny survey frame and no DIDSON to boot, all we have is fish stories.